--> Tata Sons chairman emeritus Ratan Tata has been appointed as the head of an innovation council of Indian Railways called ‘Kayakalp’, the government said on 19 March 2015. --> Railways Minister Suresh Prabhu constituted the council and appointed Tata to head it, an official statement said. --> The purpose of the council will be to recommend innovative methods and processes for the improvement, betterment and transformation of Indian Railways. --> Indian skipper Mahendra Singh Dhoni on 19 March 2015 became the first Indian captain to register 100 One Day International wins, after leading Men in Blue to a 109-run victory over Bangladesh in their 2015 ICC World Cup quarter-final match in Melbourne Cricket Ground. --> He reached the milestone of 100 wins in 178th ODI. --> The 33-year-old is also the first non-Australian to lead a national side to 100 wins in the 50 overs match. --> Ricky Ponting with 165 ODI wins and Allan Border with 107 wins are ahead of Dhoni. --> Former Lok Sabha Meira Kumar’s book entitled “Indian Parliamentary Diplomacy – Speaker’s Perspective” was released on 19 March 2015. --> The book was released by Lok Sabha Speaker Sumitra Mahajan and its first copy was presented to the President Pranab Mukherjee at a function held in Rashtrapati Bhavan, New Delhi. --> The book features an account of the parliamentary diplomacy and its role in furthering foreign policy and strengthening international relations. --> It is also a collection of select speeches and reports by Kumar during her stint as Lok Sabha speaker and as leader of Indian parliamentary delegations at several international fora. --> Union Home Minister Rajnath Singh inaugurated a three-day international conference on counter terrorism that began in Jaipur on 19 March 2015. --> During the three-day conference, issues like illegal migration and border security, Cyber space, social media and terrorism, terror trade weapons, narcotics and fake currency would be discussed in separate sessions. 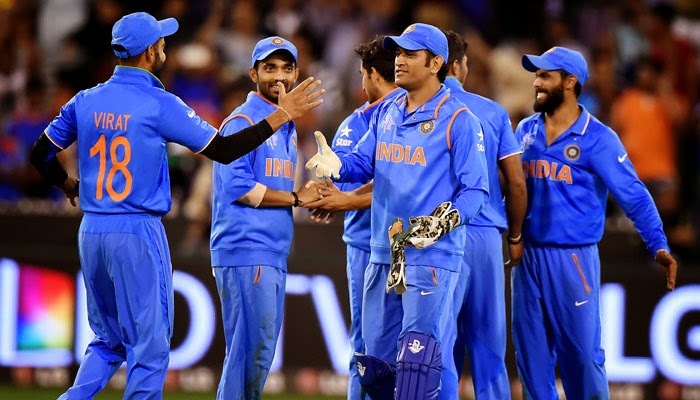 --> India stormed their way into the Semi-Finals after beating Bangladesh by 109 runs in Melbourne on 19 March 2015. --> Rohit Sharma's century and Suresh Raina's half century ensured India's victory over Bangladesh in their Quarter Finals. --> Rohit Sharma was named man of the match. --> India-born Nobel laureate Sir Venkatraman Ramakrishnan has been confirmed as president elect of Britain's prestigious Royal Society. --> His appointment was confirmed by the society’s council met on 19 March 2015 and will assume the charge on 1 December 2015. --> He will succeed eminent geneticist Sir Paul Nurse who had taken on the role in 2010 and will step down after the customary 5-year term. --> Ramakrishnan, who will be the first Indian-origin scientist to hold the post, was born in Chidambaram, Tamil Nadu, and studied biology in the US. --> India's Beyond Visual Range (BVR) air-to-air missile Astra was on 19 March 2015 successfully test fired from a Sukhoi-30 fighter aircraft for the second day in a row. --> The missile, which was fired off Odisha coast near the Integrated Test Range at Chandipur, Balasore, has been indigenously designed and developed by the Defence Research and Development Organisation (DRDO). --> The missile can reach up to 110 km when fired from an altitude of 15 km and 44 km when launched from an altitude of 8 km and 21 km when fired from sea level. --> The BJP-led Maharashtra government on 18 March 2015 decided to rename the area at Girgaum Chowpatty in the city where veteran freedom fighter Lokmanya Bal Gangadhar Tilak was cremated, as 'Swaraj Bhoomi'.